These really do make a lovely favours to give to your guests, prizes for party game winners or use for individual place card settings. Each 13cm high milk chocolate champagne shaped bottle is presented with a personalised label of your choice. Please enter these details into the text box below. Ingredients: Sugar, cocoa butter, whole milk powder, cocoa mass, skimmed milk powder, emulsifier (soya lecithin), flavouring (vanillin). May contain traces of nuts. 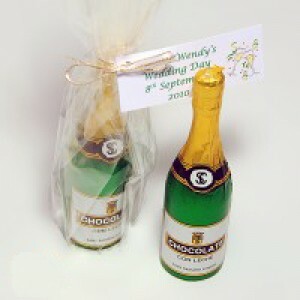 Bottles are approximately 13cm tall and are £2.35 per bottle complete with a personalised label.